The summer months are full of sunshine, laughter, food and fun. But sometimes summertime foods, drinks and more can end up as stains on your carpet or clothing. Fortunately, there are some simple solutions for those summertime stains. 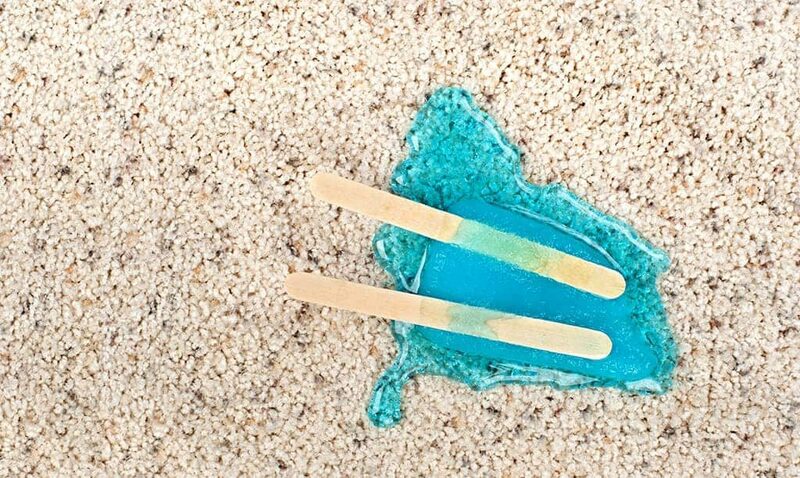 Maybe you have a child who has been known to let a popsicle slip through their fingers and onto your carpet. If this happens, stay calm and grab an empty spray bottle. Fill it with a mixture of half water, half hydrogen peroxide. Spray the stain with the mixture to dampen it. Let the solution stay on the stain for about ten minutes, then work on it with a carpet brush. Finish the job by wiping the spot with a damp sponge. Muddy footprints are a sure sign your kids are having a fun summer. But, you don’t want the remnants of their fun all over your carpet. So give the mud a chance to dry completely. Next, run your vacuum cleaner over the caked mud. If there’s any mud leftover, mix a teaspoon of mild dishwashing soap with one cup of warm water. Spray the stain with the solution and blot it with a paper towel. Kids and adults have been known to enjoy a cold glass of soda or two in the summertime. That’s peachy, until it ends up on your carpet. To clean soda stains, blot at the fresh stain with a cloth to see how much you can soak up right away. Next, mix ¼ teaspoon of mild laundry detergent with a ½ cup of water. Pour this solution onto the stain, wait a few moments, then blot it with a clean towel. During the summertime you may cut your grass every week or even every few days. Kids play in the yard, then track grass onto your carpet, leaving stains behind. To get rid of them, put several drops of mild laundry detergent onto a moist towel. Next, blot the stain with the towel until the spot is gone. Summertime and sweat stains on clothing go hand in hand. But, buying new shirts every week can get expensive. Instead, pour distilled vinegar onto an armpit stain and rub a teaspoon of salt into it. Leave your shirt out in the sun to dry before putting it into the washing machine for a traditional wash.
Our professional team of housekeepers at Fabulously Clean can thoroughly clean the carpets, counters, walls, tile floors and more in your home. We can make your Treasure Valley home look spick-and-span every season of the year! Give us a call at 208-608-4648 to ask about our affordable services.